On behalf of our millions of members and supporters, we strongly urge you to vote NO on H.R. 6784, the so-called “Manage our Wolves Act,” which would undermine the Endangered Species Act and legislatively strip most gray wolves (Canis lupus) of protections throughout the continental United States. In addition to removing most gray wolves from the federal endangered species list, this bill would preclude judicial review of de-listing actions, thus furthering a damaging trend of Congress undermining the ability of Americans to seek out justice and defend our civil rights, public health, and environment. The Endangered Species Act remains the most effective and important law to protect animal and plant species at risk of extinction. In the decades since it was enacted, 99 percent of listed species have survived, including the bald eagle, the brown pelican, and the humpback whale. It is also one of our most popular conservation laws. According to a June 2015 poll, 90 percent of American voters support the Endangered Species Act. This poll also found that 71 percent of voters believe that science, not politics, should determine when to list and delist species. A more recent study conducted by researchers at the Ohio State University found that roughly four out of five Americans support the Act. Alarmingly, nearly 120 proposals have been introduced in this Congress that would undermine the ESA. Like H.R. 6784, not one of these pieces of legislation would improve conservation and recovery of listed species. Indeed, most would increase the likelihood of extinctions. Our nation and our planet are facing an extinction crisis of epic proportion, with an overall decline of 60 percent in species population sizes between 1970 and 2014 and current rates of species extinctions 100 to 1,000 times higher than the background rate. This is not the time to be undermining the scientific and legal framework of the Endangered Species Act by inappropriately removing protections for individual species. The gray wolf is currently listed as endangered under the Endangered Species Act in most of the lower-48 states. Although once widespread, by mid-20th century, gray wolf populations had been decimated and were nearing extinction due to uncontrolled hunting and organized extermination. In 1978, gray wolves were listed under the Endangered Species Act as endangered throughout the lower 48 states and as threatened in Minnesota. While the return of gray wolves in the northern Rocky Mountains and the Great Lakes has been a success story, this iconic American species still only occupies a small portion of its former range. By no means has the gray wolf recovered in significant portions of its historic range where suitable wolf habitat remains. That work is ongoing, and the Endangered Species Act is essential to ensuring the continued success of wolf recovery in the lower 48 states. This bill would halt and reverse the progress that the Endangered Species Act has achieved for this species over the past few decades. H.R. 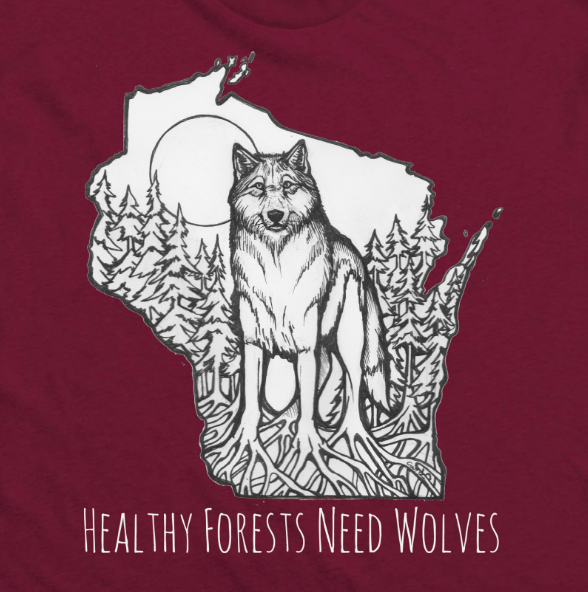 6784 would remove federal protections for wolves in Michigan, Minnesota, and Wisconsin by overriding a unanimous D.C. Circuit Court of Appeals decision issued on August 1, 2017. This bill would also unnecessarily codify a recent D.C. Circuit Court of Appeals decision that stripped federal protections for wolves in Wyoming. The plaintiffs in the Wyoming case did not appeal the court’s decision, and wolves in Wyoming were returned to state management in late April. Thus, the Wyoming portion of this bill is effectively moot, but no less damaging from an access to justice perspective, as it seeks to preclude judicial review of the court’s decision. H.R. 6784 also directs the Secretary to issue a rule removing the gray wolf in the 48 contiguous states from the ESA, except for a population of Mexican gray wolves in the Southwest. Again, this action would be precluded from judicial review. This legislation ignores many studies and polls showing that a majority of Americans want wolves conserved, protected, and humanely treated. Wolf-watching tourism brings immense benefits to local communities. Moreover, wolf- and grizzly bear-watching tourism drive over $1 billion in annual revenues to the Northern Rockies states of Idaho, Montana, and Wyoming, supporting thousands of jobs. Finally, scientific studies have shown that wolves keep America’s ecosystems abundant, diverse, and healthy. This legislation is a damaging congressional overstep with literal life-and-death consequences for wolves in the continental United States. Science, not Congress, should be the decisionmaker when it comes to endangered and threatened species. We urge you to stand up for the Endangered Species Act and rule of law by opposing H.R. 6784. How have we come to this? I feel powerless and so very sad. We have fought for decades for the conservation of our environment. We have been on the forefront worldwide. All our efforts will be undermined and we will be left with a mono-culture devoid of diversity. This will leave a precedence to be reflected in all species . There is a legacy to protect for posterity, is this not worth preserving? I ask the powers “that be” So very sad. This is a short-sighted, stupidly cruel bill! Precisely at a time when we need a forest management program to keep them from going up in flames, a long comes another pea-brained attempt to remove a necessary piece of that very ecology.